Barbie doll markings are found on right side buttock, trademark date is first date of patent, copyright in the country of issue. See below for the 1968-1972 Barbie dolls identified including photos, descriptions and doll markings. Rooted eyelashes, twisted ponytail turned to the side and tied with 3 ribbons, new hand mold undivided fingers, neck rim marked Japan, wearing a rose knit top and rose vinyl shorts. Mark: © 1967 Mattel, Inc. U.S. & Foreign Pats. Pend. Mexico. Early dolls same as above, later issue new box, has a neck rim marked Hong Kong, and new two pc. orange, red vinyl swimsuit, white and silver net jacket. Rest same as 1968. Early 1970 dolls with new hair-do, spit curls around face and curls at the neck, wears same red/orange swimsuit and white net cover up. 1971 now wears a new two pc. white swimsuit with knee length gold net cover-up. Mark Late 1970: © 1967 Mattel, Inc. U.S. & Foreign Pats. Pend. Hong Kong. This doll was clothed the same as the regular talking Barbie with a red, orange vinyl swimsuit and white silver net cover up. Same spit curl hair style and the markings are the same only the head mold was different. 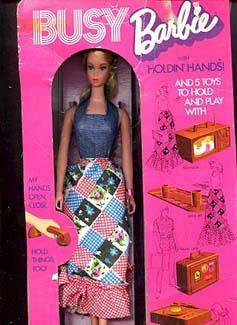 Tag reads "Made in U.S.A.", hands are the divided fingers, rest same as #1115 Barbie Mexico, except this doll spoke in Spanish. Mark: © 1967 Mattel, Inc. U.S. & Foreign Pats. Pend. Mexico. New box, new undivided fingers. Early dolls same as above, later issue new box, has a neck rim marked Hong Kong, and new 2 pc. orange, red vinyl swimsuit, white and silver net jacket. Rest same as 1968. 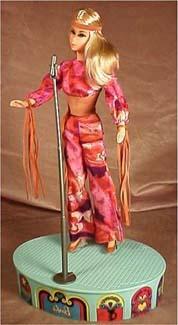 Same as 1115 Talking Barbie Hong Kong. Early 1970 dolls with new hair-do, spit curls around face and curls at the neck, wears same red/orange swimsuit and white net cover up. 1971 now wears a new two pc. white swim suit with knee length gold net cover-up. This doll was clothed the same as the regular 1115 talking Barbie with a red/orange vinyl swimsuit and white silver net cover up. 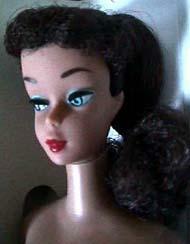 Same spit curl hair style and the markings are the same only the head mold was different and this one spoke Spanish. See doll head pictured at left. Department store exclusive, centered eyes, rooted eyelashes, short straight titian hair, no bangs, three titian hair pieces, dress has white peasant top, rose skirt, black shoes and a wide black belt. Mark: © 1966 Mattel, Inc. U.S. Patented U.S. Pat Pend. Made In Japan. Sun tan skin tone, Stacey head mold, painted eyelashes, twist waist, bendable knees, one piece blue swimsuit, sunglasses & yellow towel, no posing stand. Mark: © 1966 Mattel, Inc. U.S. Pat. Pended U.S. Pat. Pend. Made In Japan. 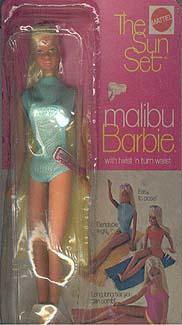 is the same as 1067 Sun Set Malibu Barbie. Same as above, no stage or box. 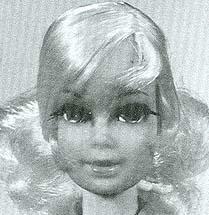 Blond hair no bangs up-do, centered blue eyes, rooted eyelashes, bendable legs and hair that grows, had two extra hair pieces with pink ribbons, hair pins & a barrette. She's wearing a pink satin party dress with a V front gore, attached gold tone belt. Mark: © 1967 Mattel, Inc. U.S. Patented Other Patents Pending Patented in Canada 1967 Taiwan. Doll is same as previous year, came wearing a peasant style dress like Barbie Busy, has the grow hair feature, blue bodice with white ties, red print long skirt, two extra hair pieces with blue ribbons. Same marking as earlier doll. They bend, they pose, they talk, their hair grows, what next? They walk! She has long pale blond hair, rooted eyelashes, bendable knees, and special arms that moved, head turns as their legs move back and forth to appear walking. She has a two piece red pantsuit with tan suede belt and red heeled shoes and yellow shoulder purse. Mark: © 1967 Mattel, Inc. U.S. Pat. Pend. Taiwan. Brunette ponytail, blue eyes, painted eye rims, tan skin tone, wearing the black & white zebra swimsuit from the early years. 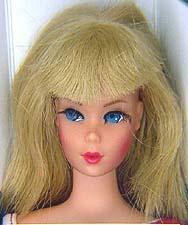 Looks similar to the 1964 Barbie. 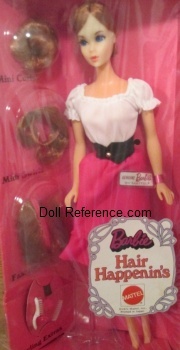 Mark: Midge™ 1962 Barbie ® 1958 by Mattel, Inc. Patented. These dolls have special hands that can hold things. They have bendable legs and elbows, and twist waists, short curly blond hair with bangs, rooted eyelashes, she's wearing a blue bib hot-pants with dusty-pink attached long sleeve blouse, rose hat, green belt and knee high boots and the 5 accessories to hold and play with; a telephone, television, serving tray set, travel case & record player. Marks (1972): ©1967/Mattel, Inc./U.S. & Foreign/Pats. Pend/Hong Kong. Slightly different voice, rest same as 1972 with new markings. Marks (1973): © 1967 Mattel, Inc. U.S. & For. Pat'd. Pat'd. In Canada 1967 Other Pat's. Pend. Hong Kong. Same hands, body style and accessories as 1195. She has long blond hair parted on the side, painted eyelashes, wearing a denim top with attached patchwork gingham skirt with one ruffle at hem. Mark: © 1966 Mattel, Inc. U.S. & Foreign Patented Other Pat's. Pending Made in U.S.A.
Now made in Hong Kong, new markings, rest about the same as 1972. Mark: © 1966 Mattel, Inc. U.S. & Foreign Patented Other Pat's. Pending Made in Hong Kong.